When I started my life of activism I worked on political issues, ones that make the blood boil, and experienced the government and corporations trying to poison the largest aquifer in the US with radioactive waste. We fought extremely important fights and we won some battles temporarily but often ended up losing them again later when we weren’t looking or lacked organisation. Then, working in state legislature and on local politics, I soon realised that if you win it’s often a fluke — if you challenge business interests the money game is almost always stacked in their favour. This leads to a growing sense of disempowerment with our political system, which is at once undeniably realistic and at the same time a self-fulfilling prophecy. The system is clearly broken and the game needs to be changed: We need a new blueprint for the economy and a new infrastructure and culture to support it. After the 2008 financial collapse it began to change with the emergence of the Occupy movement and with growing numbers of young adults beginning to create their own economies based on a do-it-yourself ethic (or rather, more accurately, a ‘do-it-together’ ethic), and sharing what they have (materials) and what they know (cognitive) with their peers. If greed was a major characteristic of the dying economy, sharing is a key element of the blueprint or DNA for the new economy. Instead of a trickle down economics managed by representative policy makers, we have a new generation that’s having fun building the new economy from the bottom up through sharing projects. Sharing might sound soft as a social change strategy, but it also has a broad appeal and the advantage of transcending traditional political boundaries. Sharing was a basic moral principle imparted repeatedly since my days in day care when we children fought over toys — even God asked us to share over and over again in the Bible and named greed as one of the seven deadly sins. Sharing, even in a culture of competition and free market economics, is a really tough idea to argue with — and if you do you seem, well, just plain greedy. Another powerful aspect of sharing is that many of its manifestations, such as community gardens, co-operative houses, free skools, childcare collectives, community acupuncture clinics, tool and seed libraries tend to address Abraham Mazlow’s hierarchy of needs better than the selfless and delayed gratification in most conventional activism. This makes sharing both more attractive and more sustainable, especially for the cash-strapped, debt ridden Generation Y. Sharing can help you meet your physical needs for food, housing and transportation, and also the needs of economic and emotional security, caring relationships, self-esteem, self-actualization and creativity. It can also drastically help you cut your living costs and help other people do the same, which means we are less dependent on jobs that are working against our principles. Sharing is also direct action: often, it involves no demands on a representative in power to do something on your behalf and hoping that someday it happens — you just do it. It is more complicated, though, if you’re trying to get your city or university to support something like a major bike-share program. Even then, it’s an easy sell: save money and other resources, protect the environment, and serve your constituents better. Who could argue? I am not trying to undersell political activism, it’s crucial to changing the game. However I am not sure the game can be changed until we take back our economies—returning our energy, resources and power to our communities and then building from there. 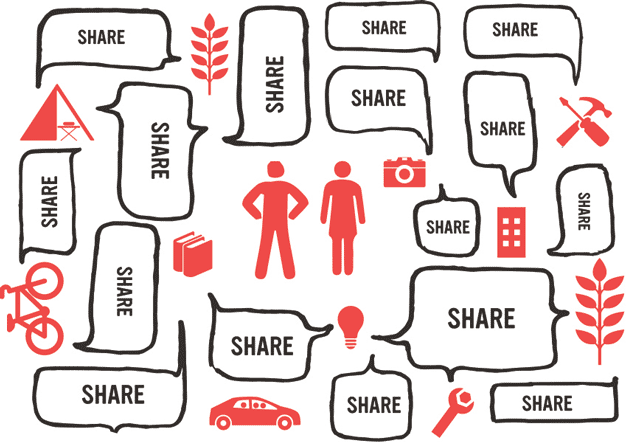 Sharing can be a tool to make other community projects or political campaigns happen. With dwindling resources for social change from foundations and donors — there’s just not enough philanthropist dollars to go around — we have to be more resourceful. We need to think and ask: How can we do this work without money? Here, sharing can inspire creative problem-solving. We should also be asking: What resources do our allies have and what do we have that we can share? How can we use alternative exchanges to make projects possible when they are backed by labour and community trust rather than money? This is a strategy that was used widely during the last Great Depression and is now experiencing a renaissance of innovation. How can we make the limited money we have go further by co-working, using open source software, bartering for services, offering excess capacity of resources like space for exchange, and borrowing or collectively owning rather than individually buying expensive goods? It can be a game of how fluid you can make your resources, going both in and out. I am not trying to undersell political activism, it’s crucial to changing the game. However I am not sure the game can be changed until we take back our economies — returning our energy, resources and power to our communities and then building from there. We’ve lost our foundation and we need to get it back. Part of the equation is political activism for things like a living wage, affordable (preferably co-operative) housing, health care, and public banking, and part of it could be directly, collectively taking control over our resources and labour. As long as we are enslaved in debt and working full-time jobs, our actual capacity to create social change is limited — even if we are selfless and tireless activists, we will burn out fast. Sharing immediately removes some of the financial burden and simultaneously improves our quality of life through greater access to resources, skills and relationships. Sharing can also be a positively reinforcing step towards psychological empowerment as well. Any experienced organiser will tell you, in most cases, it’s best to start with some small wins to get people to believe that after much hard work they can win bigger fights. And in most sharing projects, it’s rare that you’ll lose at all. Even if at some point the community bike kitchen closes, lots of people have already learned how to fix their own bikes and have low cost, independent, sustainable transportation that no one can deny them. Those people can continue to teach other people, and likely as members of a collective project, they’ve learned how to get along better, are more connected to their community and feel more empowered — that’s no small step forward. The experience of sharing can create a greater sense of trust in each other and belief that a different kind of economy can work. As in the instance of group therapy, sharing can drastically change our psychology, world-view, and principles for the better, particularly in our alienated and individualist culture. Lastly, it’s a hard strategy to challenge even if there was a lot of money and power against it. If you count all the community gardens, housing and worker co-operatives, co-working and maker spaces, open-source projects, time banks and local currencies, bike and computer kitchens, clothing and book swaps, Really Really Free Markets, there are many thousands, maybe millions of projects. They take very different forms all over the world and new ones are being invented all the time. People in one part of the world can simply and quickly learn about the model and replicate and modify it for their own local context. They are also mostly independent and locally run. It’s a diverse, resilient, leaderless movement, which means it’s impossible to stop as a whole. At the same time, this also means it’s hard to engineer or organise — the good news, though, is it’s already happening and it’s growing unbelievably fast. Mira Luna is the Organising Director and a writer for Shareable, covering grassroots economics. She is a long time social and environmental justice activist, community organiser and journalist, working to develop an alternative economy. She co-founded Bay Area Community Exchange, a regional open source time bank, the San Francisco Really Really Free Market and JASecon, and has served on the boards of the Board of the San Francisco Community Land Trust and the US Solidarity Economy Network (current). She now believes change starts in your community from the bottom up, in collaboration.